“So you were in Tampa because… Are you… ? Never mind. I don’t discuss politics with people I don’t know,” said the man sitting next to me at a coffee shop in Brooklyn. I told him I’d been at the Republican National Convention doing media work. He said that he’d protested the RNC when it was in New York, and that he thought Republicans were just angry. After a week immersed in conservative American values, it struck me that this man was willing to dismiss half of his nation’s voting population as nothing more and nothing less than angry. 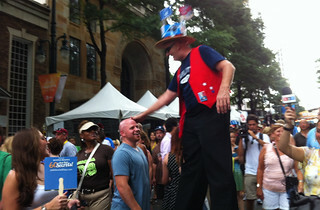 The DNC kicked off with a street festival on Tryon St. in downtown Charlotte. Two days later, I’m here at the Democratic National Convention. The City of Charlotte is bustling with Democrats. A packed street fair opened the week on Monday. Live music, food booths, and tents filled with Obama t-shirts and SEIU pins lined Tryon Street. Downtown, an open Internet network called “Convention” is available to anyone with a laptop or smart phone. At least four people offered to help me register to vote in less than an hour. CoLab Radio is also welcoming posts from you all again this week. Check out our blog post prompt if you’re interested in contributing. Post by Alexa Mills. Check out all of CoLab’s convention posts here. CoLab Radio does not endorse any political party or candidate. Convention #2 Alexa. Can’t wait to hear the details! Thanks Michelle! It was a fascinating two weeks. I have a new lens on America. I hope you liked some of the articles and profiles.